FRISCO, Texas — Two separate generations have differing impressions of Texas football — one built on a tradition of winning and another that has seen the Longhorns go to just one bowl game in the past three seasons and post three consecutive losing campaigns. It’s up to Texas’ new coach, Tom Herman, and his staff to make sure that the recent downswing in Longhorns football is not the only thing that’s in the minds of the players he’s working to bring to Austin to turn that tide. 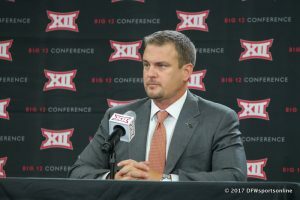 Herman spoke on Tuesday at Day 2 of the Big 12 Media Days about the expectations for his team and the perceptions he and his assistant coaches are working against to reboot the Longhorns. It seems like it’s been eons since Texas, which went 16-21 in three seasons under Charlie Strong, was among college football’s elite teams. Herman mentioned the not-that-long-ago string of campaigns from 2001-09 in which the Longhorns produced at least 10 victories per season, two appearances in the national championship game, and a title in 2005, but understands that today’s players barely remember those successes. Only three current Longhorns have even been on a winning team in Austin. Herman, who joined the Longhorns after two successful seasons at Houston, made “rebranding Texas football” one of his top priorities in his first season. And while his players have bought in to the changes he and his staff have brought to Austin, Herman said it’s too early to heap huge expectations on a team that hasn’t enjoyed a winning season since 2013 and has posted only three since the 2009 campaign. “All of you are going to ask me about expectations,” Herman said. “I don’t know. I know that these guys are going to be trained as well as anybody in the country, and we’re going to play to our maximum potential. What that is, I don’t know right now. Texas, which was picked fourth in the Big 12’s preseason media poll behind Oklahoma, Oklahoma State and Kansas State, will be tested by the tough and balanced league and by a non-conference schedule that includes a road game at USC on Sept. 16.